Anyway, here is my Cafe Wall Illusion quilt. 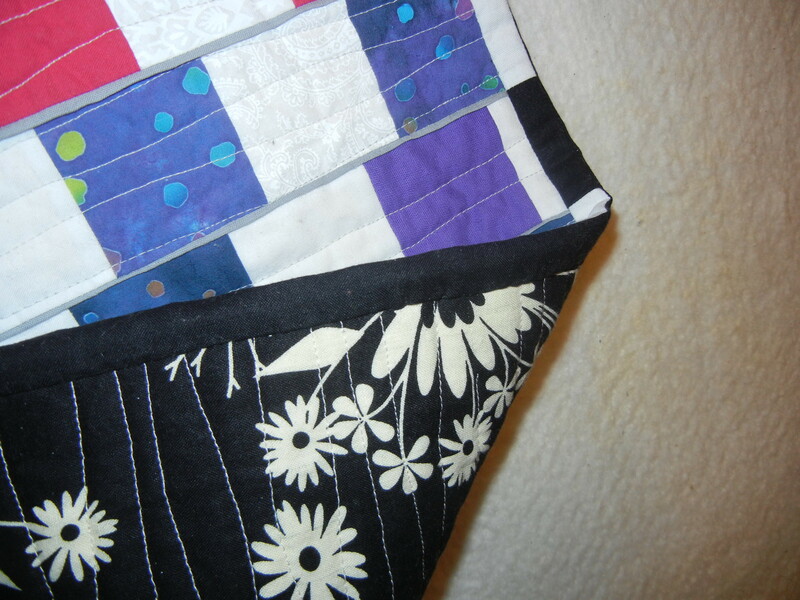 I had the top pieced six months ago, but over the last few days I quilted it and applied the binding. The binding I decided on was complicated – and further complicated by the fact that I wanted the front and the back of the binding to be different. This binding took FOREVER. Looking back, I don’t know if I would have attempted it without the storm giving me lots of time. 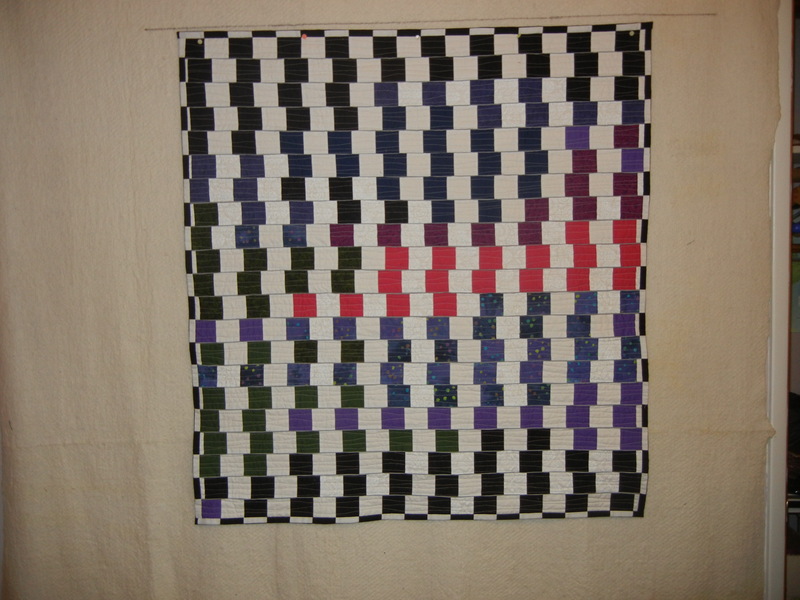 Cafe Wall Illusion quilt – The horizontal lines in this quilt are parallel to one another. All of the squares, except for those in the binding, are the same size. The illusion is that the squares get smaller toward one end of each row. How cool is that! This is the back of Cafe Wall Illusion. If you look carefully at the top you can see I added a hanging sleeve. I meant for the sleeve to line up with the cross design, but when I laid it out I must have had the quilt upside down. By the time I noticed the error, there was no way I was ripping it out and starting over to get it right. I think I’ll continue to be amused by this particular error. This is a closeup of the “Complicated Binding”. The front mirrors the alternating dark and light blocks found on the front, but the back of the binding is solid. 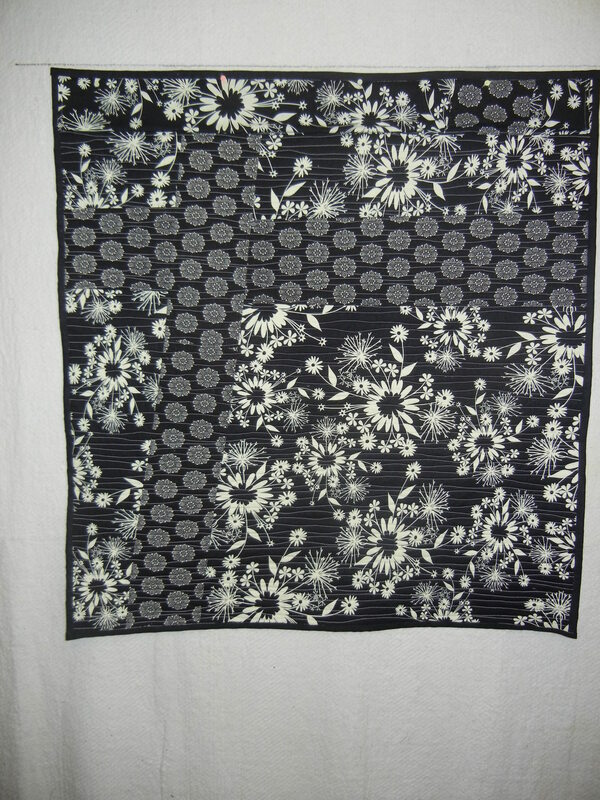 I did this because the backing fabric isn’t actually black and white, but an off-white. I thought the white-white of the blocks on the front would clash with the off-white found on the back. So I came up with this design solution.